Did you know that many poskim hold that Birchos HaTorah must be recited BEFORE Ma Tovu and Reishis Chochmah? Did you know that it’s preferable to say Elokai Neshama right after Asher Yatzar? This Morning Brachos & Routine card is meant to assist those who wish to follow the preferred order of brachos, tefillos, and washing netilas yadayim in the morning. 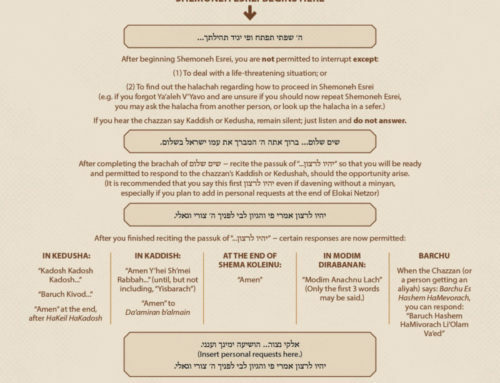 Although this is the recommended order, some parts of this procedure are not the strict halachah, but rather recommended, due to various important halachic considerations. It is still possible to follow all halachos if you do your morning routine in a different order. Please consult with your own Rav for guidance in this matter. The card is designed for women who do not go to shul, but includes many halachos that men can benefit from, as well. For more information, please listen to the full shiur, or email Rabbi Eliezer Krohn at ekbris@gmail.com. Questions or comments? Please email torahdesigns@gmail.com. Click on the images below to view a printable version. “Immediately after waking up” – Modeh Ani should be said as soon as possible after you wake up. If you plan to “snooze” your alarm and fall back asleep, do not recite Modeh Ani yet. Wait until you are fully awake and ready for the day – when you are not planning to snooze any more – and then say Modeh Ani. “Before Getting Out of Bed” – Modeh Ani should be recited immediately upon awakening, even before washing netilas yadayim. You do not need to wash netilas yadayim before saying Modeh Ani, because Modeh Ani is simply a hoda’ah (giving thanks to Hashem) – it is not a brachah or a tefillah and does not include Hashem’s name. “Modeh” – Some women have the custom to say “Modah” (the grammatical formulation for females) rather than “Modeh.” Consult with your own poseik to determine which formulation to say. “Wash Netilas Yadayim” – This washing fulfills the mitzvah of netilas yadayim – the requirement to wash your hands every morning in the following manner: (1) Fill a cup with water. (2) Pour water over your entire right hand. (3) Pour water over your entire left hand. (4) Repeat steps 2 and 3 for a total of three times. “As soon as possible” – Netilas yadayim should be done as soon as possible after you wake up, in order to get rid of the tumah (spiritual impurity) that overtakes a person while they are sleeping at night. Preferably, you should wash netilas yadayim even before using the restroom. If, however, you have reached the point of “baal tishaketzu” – i.e. you need to use the restroom very badly – then it is forbidden to delay, and you should wash netilas yadayim (with a cup and a brachah) after using the restroom. “…But do not say the brachah yet” – Even though you have just washed your hands to fulfill the mitzvah of netilas yadayim, you should not recite the brachah on this washing yet, because it is likely that you need to use the restroom as soon as you wake up in the morning, and it is forbidden to say a brachah when one needs to use the restroom. “No cup necessary” – This washing is not to fulfill the mitzvah of netilas yadayim, because you already washed netilas yadayim earlier (before using the restroom). Rather, you are washing your hands now as your normally do, after every time that you use the restroom throughout the day. It is not necessary to use a cup when washing after the restroom, although some are makpid (careful) to do so. “Step out of the restroom” – It is forbidden to recite brachos while one is in the restroom. “Al Netilas Yadayim” – This brachah is connected to the netilas yadayim that you did immediately after waking up, before using the restroom. This brachah of netilas yadayim should be recited as soon as possible after your earlier act of washing your hands. The only reason why it was not recited earlier (before using the restroom) is because one is not allowed to say a brachah when one feels the need to use the restroom (see note 6). “Al Netilas Yadayim” – Since you already said the brachah of netilas yadayim here, you should not recite it again later when you begin davening from a siddur. 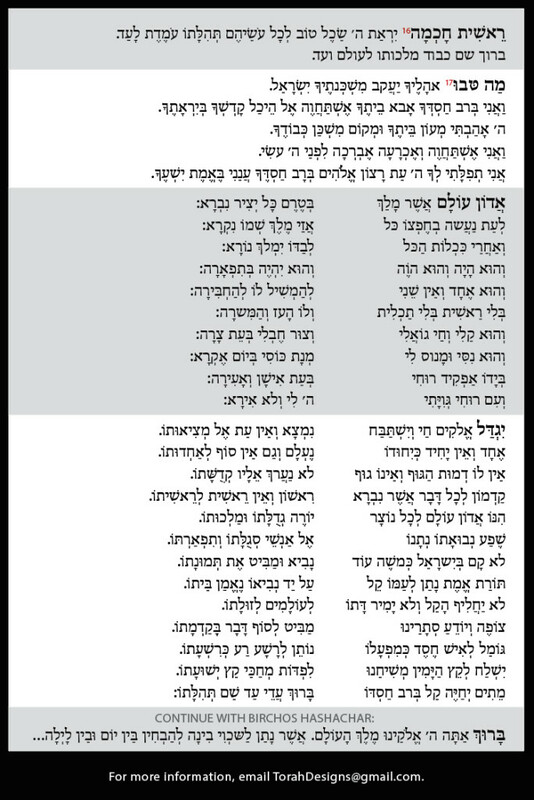 “Asher Yatzar” – Since you already said the brachah of Asher Yatzar here, you should not recite it again later when you begin davening from a siddur. However, if you use the restroom again between now and when you begin davening, then you should recite Asher Yatzar again after using the restroom, as usual. 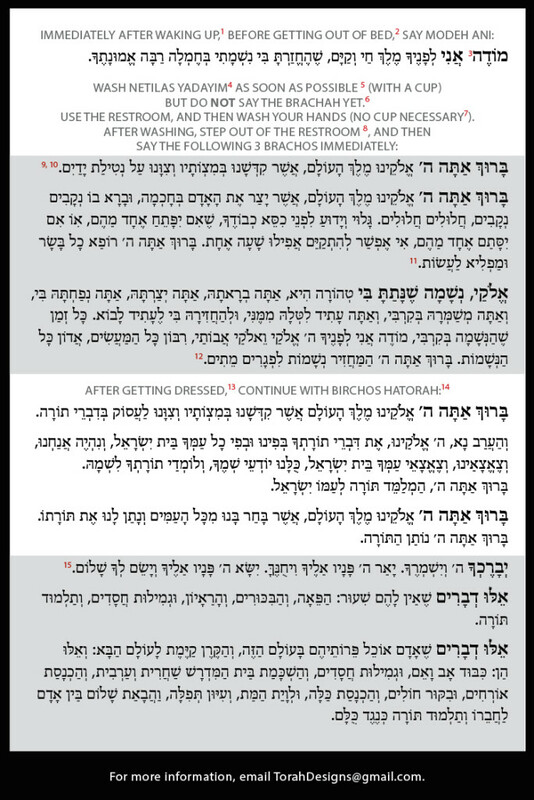 “After getting dressed” – Birchos HaTorah do not need to be recited immediately after getting dressed. It is permissible to do certain other essential activities before saying Birchos HaTorah, such as taking out the garbage. “Birchos HaTorah” – If a woman is short on time, she should – at the very least – recite Birchos HaTorah, because these brachos includes the 3 essential components of tefilah: shevach (praising Hashem), bakashah (requests), and hoda’ah (thanks). “Reishis chochma…” – Reishis Chochma is a passuk from Tehillim (111:10). Although many siddurim print Reishis Chochma right after Modeh Ani, there is a machlokes as to whether or not you are allowed to say pesukim like this before Birchos HaTorah. Therefore, it is preferable to wait and say Reishis Chochmah after you have already recited Birchos HaTorah.